We'd suspected it all along but it turns out seahorses are actually a little bit magic. The intriguing little creatures are maritime Harry Potters, equipped with an almost magical ability to make themselves invisible to prey, research has shown. Their delicate heads are designed to prevent disturbances in the water that would otherwise be detected by the tiny copepod crustaceans on which they feed. Copepods have an inbuilt alarm system that allows them to react to "bow waves" from an advancing predator in less than three milliseconds. Once alerted, they jolt away at speeds of more than 500 body lengths per second, the equivalent of a six-foot human swimming at 2,000mph. Yet 90% of the time, they are caught by seahorses. Scientists in the US have learned the secret of the seahorse's predatory success - effectively an "invisibility cloak" that enables them to sneak up on copepods undetected. "Seahorses have the capability to overcome the sensory abilities of one of the most talented escape artists in the aquatic world - copepods," said lead scientist Brad Gemmell, from the University of Texas Marine Science Institute. "People often don't think of seahorses as amazing predators, but they really are." Dr Gemmell's team used high-speed 3D imaging techniques to study the dwarf seahorse, Hippocampus zosterae, from the Bahamas and the US. The researchers, whose findings appear in the journal Nature Communications, discovered that the unusual shape of a seahorse's head helps prevent waves forming in front the slow-swimming creature. Just above and in front of seahorses' nostrils is a "no wake zone" where the water disturbance was almost zero. Seahorses angle their heads in relation to their prey to take advantage of this and avoid detection. 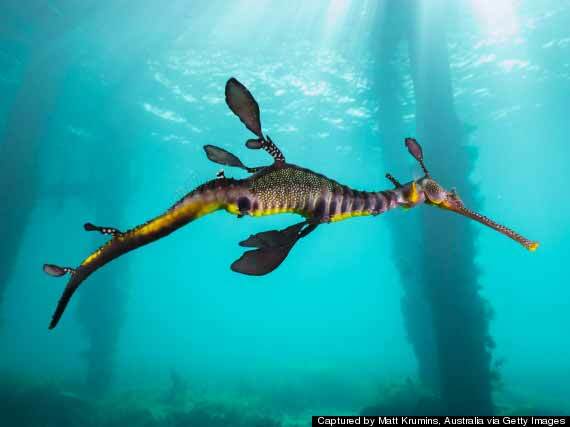 The unique head shape of seahorses, and their relatives, pipefish and sea dragons, evolved as a result of natural selection pressure favouring individuals able to get close to their prey, the scientists believe. "It's like an arms race between predator and prey, and the seahorse has developed a good method for getting close enough so that their striking distance is very short," said Dr Gemmell. Seahorses employ a technique known as "pivot feeding", rapidly rotating their heads upwards to draw their prey in with suction in less than a millisecond. However, this method only works over extremely short distances of around one millimetre, making it essential to approach without being noticed. Once a seahorse, cloaked by its head shape, gets within range of a copepod, the crustacean stands no chance. "A seahorse is one of the slowest swimming fish that we know of, but it's able to capture prey that swim at incredible speeds for their size," said Dr Gemmell. "We wanted to know why."